Use the Ethernet hardware block to connect your stack to your local LAN network and the internet if it is connected to your router. In your Stackbuilder blueprint, drag and drop the Ethernet block from the Hardware tab into your blueprint. The connector is a standard RJ-45 connector. 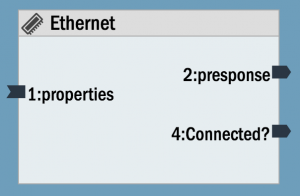 To set properties in Stackbuilder: Select the Ethernet block by clicking on it once. Click in the “Property Editor” in the bottom right, in the “Initial Value” column for the property you want to edit (if a character or string, use quotes). Use other blocks, like “Interstack Send” or “Interstack Receive” (in Hardware tab) or “HTTP API” block (in Software tab) to communicate with other stacks, and web sites or industrial IoT platforms on the internet or on-premise. Version (int): Firmware VersionDHCP (int): Use DHCP. 0 static IP. 1 use DHCP (default). Mode (int): Module mode: 0 Client mode (default), 2 Simultaneous AP and Client, 3 AP access point mode only. This hardware module supports dynamic creation of stack-to-stack send and receive blocks, and TCP Client blocks. The corner LED will flash orange when it is trying to connect to a LAN. Once it gets its IP address from the LAN, it will stop flashing and resume normal behavior.Refer to documentation on many other topics at interstacks.com/knowledge-base.